I’m getting really excited for the August PrintSource show. I’m especially looking forward to seeing the UK based company, Peagreen‘s booth. Their prints definitely stand out. At the show they display large banners of their bold and illustrative patterns living up to their “design agenda” with “fresh, contemporary, versatile, intelligent, and unique” designs for the edgiest clients from Urban Outfitters to Moma to Ikea. 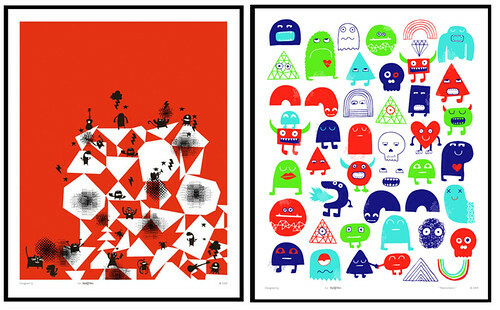 They’re right on top of the game with their own blog and limited edition art shop. Above are some of their bold patterns and motifs and below is my little interview with them and a couple of posters I have my eye on for Henry’s room. Henry will be born in October so I figure I better start his room off with some fantastic Peagreen posters! Enjoy the interview and check out Peagreen’s site for yourself if you won’t be visiting them at PrintSource in booth E18/20 (down the aisle from my little booth, E8). 1. 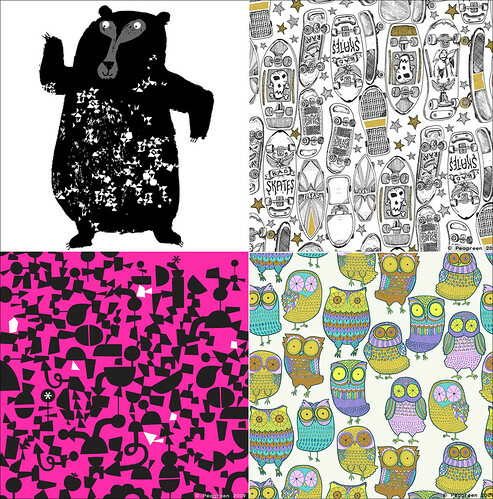 How long have you been in the surface pattern business? The pea left the pod in 1996 and has grown since then! 4. Do you work from personal points of inspiration or follow trend watching sites? We get inspiration from anything & everything from blogs, shops, books (new & old), vintage items, movies, music, magazines, exhibitions, old photos and toys & flea markets! 5. Do you use trend watching sites for color or motif ideas? We keep up with themes and trends through all these sources…they are all great! 6. Plusses and minuses to working in a collective? So many ideas not enough time! 7. Anything else you would like to share with Maquette readers about you and your designs? We are currently working on a range of limited edition Art Print Posters that you can buy from our website and a Gallery show at our studio in September which we will release super special new prints and products for the event. Come and be a Peafriend & follow our Blog for the latest!! Great find, You’ve been linked! Yes Peagreen is really really fantastic!! Thanks Emilie!!! Will check out the pretty chronicles! OMG – I need their panda print! I know….it’s just too fun….like everything they do.